I’ve recently spent several months testing Squash Analysis, a video coaching service run by Australian squash coach Garry Pedersen. If you’d like some more videos, Garry has put together this free series on generating more power on your backhand drive. After watching the free videos, you’ll have the option to sign up for Garry’s premium service and get a new instruction video every week. I’m an affiliate of Garry’s, so if you end up purchasing his service, I will get a small commission (thanks!). Garry’s videos are designed to help you improve your strokes, movement, and other areas. 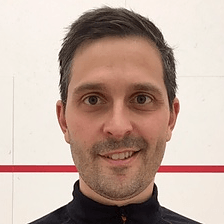 It’s similar to Squash Skills, another video training site you may have heard of, except Garry focuses more on club players. He goes into detail on the swing mechanics and body positions that will help you get good outcomes on your shots from various areas of the court. One of the things I like about Squash Analysis is it’s a manageable flow of information. Subscribers get two videos a week, delivered via email. The videos are usually short, only a few minutes long. The ideas are easy to digest and incorporate into your game. Again, you can check out more free videos from Garry here.